Discover all that the Sequim Valley has to offer. Hiking, kayaking, boating, Parks, Olympic Game Farm, Lavender Farms, beaches and more. Take a drive or cycle your way through the multiple Lavender Farms that dot the Sequim Valley. Most Local farms and gift stores are open Memorial Day through Labor Day. Enjoy everything Lavender during the annual Lavender Festival Weekend and Farm Tour the third weekend in July. Beautiful and fragrant, these fields will indulge your senses and have you coming back time and again. Join local artisans and produce vendors as they showcase their wares every Saturday at the City Center Plaza on North Sequim Ave. The market is open from May 4th to October 26th, 9am - 3pm. Hang out with the locals and enjoy Sequim`s sunny disposition. The Historic Dungeness Lighthouse sits at the tip of the world`s longest naturally occurring sandspit totally 5.5 miles of beautiful beach. The beach is also home to the Dungeness National Wildlife Refuge, a sanctuary for over 250 species of birds, as well as a large number of land and water mammals. Take a picnic and enjoy the many trails and spectacular viewing areas that look out over the Strait of Juan de Fuca. The views are especially mesmerizing at Sunset. If you do hike out to the Lighthouse, watch for tides, remember water, and start early as it is 11 miles round trip!!! Not to miss fun for the whole family! Experience getting slobbered on by a wild buffalo as you take a driving tour through the Park seeing zebra, Roosevelt Elk, yaks, llamas, grizzly bears, and more face to face! A shorter walking tour lets you get a close up view of a Siberian Tiger, bobcats, Arctic fox and Timberwolves. Children will love getting to take a ride on a camel or pony and visiting the smaller animals in the petting farm. The Farm has a great gift shop and picnic areas. Even if you don`t have a boat or kayak, the Marina and Park are fun to explore and have a picnic. Public beach access and boat launch are easily reached if you did bring your own kayak. The Dockside Grill is located in the main facility overlooking the Marina and has phenomenal food. Looking for a wedding venue? There is a fantastic banquet facility for rent. Check out GoXpeditions for kayak and SUP board rentals, located right on the dock. Follow Port Williams Road all the way to the end to find one of the best public beaches in Sequim. 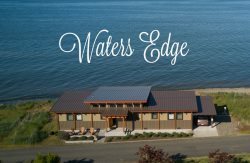 Family and pet friendly with boat launch and picnic area. Great for bird watching, taking long walks or launching your kayaks. Located on the Olympic Discovery Trail, this is a must see for families and nature lovers. Enjoy the Center`s educational, interpretive and interactive displays while learning about the native plants, birds and wildlife. Take a long walk or bike ride across the Railroad Bridge and through the woods along the Trail enjoying the sights and sounds of the nature around you. In the summer, a nice little beach along the river is great for picnics and taking a swim. Carrie Blake Park has several playground areas, swings, picnic and grilling sites, a dog park, ponds and trails and a BMX dirt track and skateboard park. Fun for both young and old, the Olympic Discovery Trail also runs through the Park and is a great place to park and start your walk or bike ride. Enjoy stunning views of the Sequim Valley, Olympic Mountains, Cascade Mountains, San Juan Islands and Vancouver Island from a unique and exciting perspective on a Hot Air Balloon ride with Captain Crystal and the Morning Star Balloon Company. Many flight packages available for Birthdays, Anniversary`s, Weddings or just fulfilling a dream! Flights last 50 minutes to 1 hour and conclude with champagne/sparkling cider and cupcakes.